Interplanetary Contamination is the introduction of biological material from one planetary body (planet, moon, asteroid) to another. Biological material can be everything from simple organic carbon molecules via parts of genetic code or proteins up to full microbial life forms. Astrobiology, an interdisciplinary field that also deals with contamination, studies two types of contamination: Forward and Backward Contamination. Forward Contamination is the artificial delivery of biological material from Earth to a planetary body with space probes or human space missions, while Backward Contamination describes the possible introduction of alien material environment through extraterrestrial probes returning back to Earth. Forward and Backward Contamination. – Credits: NASA. Why Does Interplanetary Contamination Matters? Interplanetary contamination is important for both scientific and ethical reasons. “The exploration and use of outer space, including the Moon and other celestial bodies shall be carried out for the benefit and in the interests of all countries, irrespective of their degree of economic or scientific development, and shall be the province of all mankind” (UN 1967). The idea of “province of all mankind” underlines the ethical duty to protect outer space and the celestial bodies, especially from contamination! To travel abroad with animals here on Earth, we must be sure that they have received proper vaccinations, that they have all the necessary papers (including a passport), and that they have the clearance to go abroad with the possibility of quarantine if required by the incoming State’s laws. When traveling in and out of Hawaii, we must declare on a form all agricultural items we want to bring with us. Some goods cannot be brought into Hawaii without “prior arrangements for permit and/or quarantine, treatments, or certification.” These examples show how we try to control contaminants here on Earth to keep its ecosystem safe. 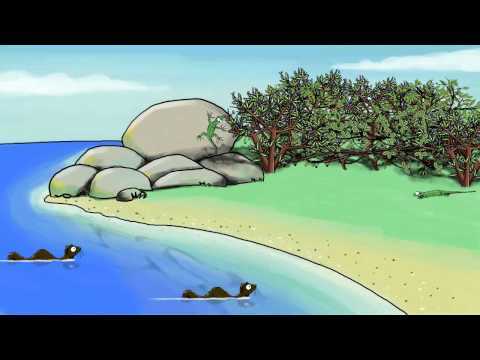 “Leave the beach as you find it,” reads a typical recommendation to tourists in coastal areas. These guidelines are needed to preserve the quality of the beach for its plants and animals and the ocean itself. This is another perfect example of what is being done for space. That is exactly what scientists try to do when planning an interplanetary mission to preserve the wellbeing of celestial bodies and ensure a pristine and safe way to explore outer space. Outer space and the celestial bodies are considered global resources for the benefit of all mankind, therefore it is our duty to legally protect and preserve space and its celestial bodies for everyone and for the bodies themselves. Laws, policies, guidelines, and so on are therefore important tools to ensure to the safety and protection of outer space. Dr. Cassie Conley, Planetary Protection Officer, NASA, describes the development of international guidelines for spacefaring nations to protect against the contamination of other planets. Have we Ever Been Exposed to Contamination Risk? Forward and Backward Contamination are not just theoretical ideas: in the 60 years of spaceflight history. During the Apollo program, NASA had a Lunar Quarantine Program for the astronauts when they came back from their Lunar missions. Back in the late 1960’s and into the 1970’s NASA was concerned about what the astronauts, hardware, and samples might bring back from the Moon to potentially contaminate Earth. Therefore, each Apollo mission went through a rigorous quarantine process for 30 days to make sure that nothing or no astronaut that came back could – worst case scenario – wipe out the human race via Moon “space germs” or contaminants. – Read more about NASA Lunar Quarantine Program. 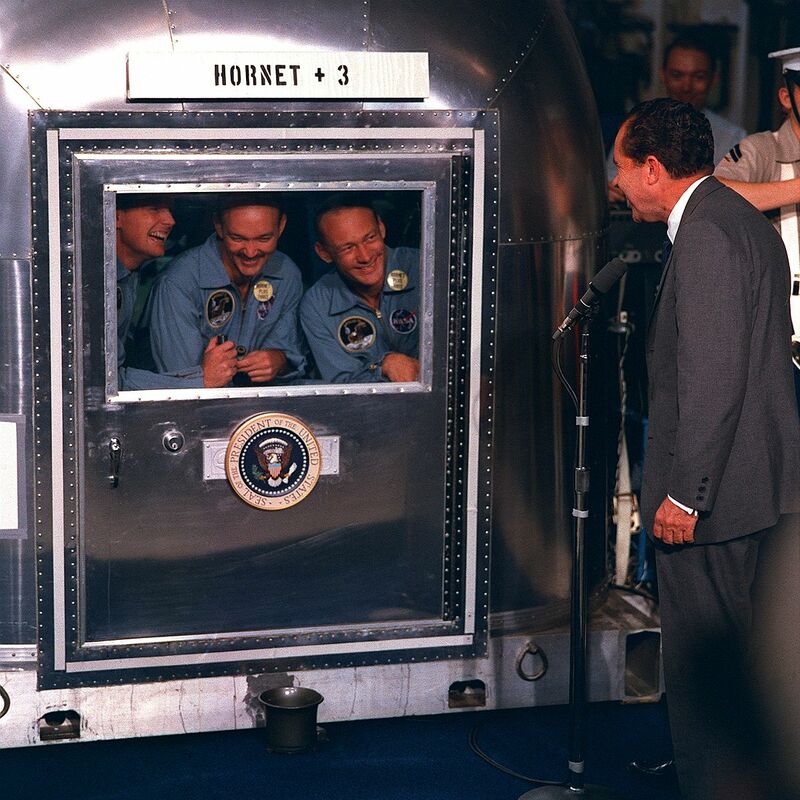 Apollo 11 astronauts Neil Armstrong, Buzz Aldrin, and Michael Collins talk with Pres. Nixon from the Mobile Quarantine Facility, an anti-contamination measure devised to prevent backward contamination from the Moon. – Credits: NASA. What are the Current Methods for Preventing or Reducing Contamination? Currently there are several methods to decrease the contamination of planetary bodies by space probes. There are technical aspects, such as the sterilization of all hardware items that will fly on a space mission. Additionally the use of new materials that are less affine to biological materials or have a sterilizing effect can keep the contamination low. However, there is not a 100% way of preventing of transporting microbial life onto a spacecraft. Moreover, the sterilization only kills the life forms, but does not prevent their organic material to be still attached to the space hardware. Therefore, another approach is to create a preflight study that considers what types of biological materials or microbes are still attached to the space hardware. The material may even be marked, enabling the ability to distinguish terrestrial from extraterrestrial material later on. Human spaceflight missions to other planetary bodies will surely contain a lot of organic material, like the organic molecules exhaled or transpired via the human metabolism, dead skin cells, human waste, and of course a multitude of different microbes that the human body carries. While working with samples collected on another planetary body, there is a high risk to contaminate samples with cells, microbes or organic material coming from our own body. To reduce these risks we can optimize the work process to have as little contact as possible with the sample, and use tracers to track the path of possible contamination. If you find tracers on your probe, you know for sure that contamination has happened and that the organic compounds on the probe are most likely your own. All of these methods have their limitations, and therefore they will never be 100% secure, but they can drastically reduce the risk of contamination. In theory, the strategies to reduce contamination risk need to be cleaner than the resolution of the best detection instrument, so possible contamination does not disturb the measurement. But detection methods will become better and more sensitive, so future measurements will likely be able to detect the contamination. Then it might not be possible to distinguish the contamination from possible indigenous material anymore. Therefore the contamination must be kept as minimal as possible and even that minimum needs to be well known. In the video below, the Space Assembly Facility clean room at NASA’s Jet Propulsion Laboratory, the Mars Science Laboratory rover Curiosity was sterilized before its mission to Mars. States Parties to the Treaty shall pursue studies of outer space, including the Moon and other celestial bodies, and conduct exploration of them so as to avoid their harmful contamination and also adverse changes in the environment of the Earth resulting from the introduction of extraterrestrial matter, and where necessary, shall adopt appropriate measures for this purpose (UN 1967). The Committee on Space Research (COSPAR) has created the COSPAR Planetary Protection Policy that is in line with and follows the Outer Space Treaty. While connected to a legally binding treaty, the COSPAR Planetary Protection Policy is not itself a legally binding treaty—rather a set of guidelines on contamination that spacefaring nations should follow when considering space exploration. 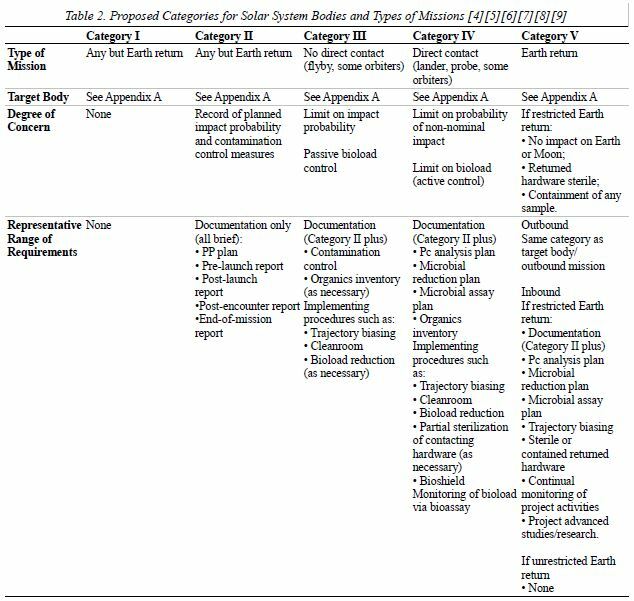 Within the Policy, there are five categories for “target body/mission type combinations” with increasing contamination implications: fly-bys, orbiters, landers, probes, non-Earth returns, and Earth returns. According to the Policy guidelines there is a bigger risk to contaminate Mars (Category IV on Policy scale) than to contaminate a celestial body that does not have the potential to harbor life such as the Moon (Category I on Policy scale). On the other hand, if these same mission to Mars and to the Moon return to Earth, they are both considered a Category V, the highest level in the scale, because of potential backward contamination risk. These guidelines have been conceived to attempt keeping both the celestial bodies – especially those with plausible presence of life – and Earth safe from contamination from another celestial body. For Europe, ESA has a Planetary Protection Officer who oversees “efforts to prevent microbial lifeforms hitching a ride on missions to other planets and moons in our Solar System.” ESA also has the European Cooperation for Space Standardization (ECSS), which has standards for ESA and it’s spacefaring nations. 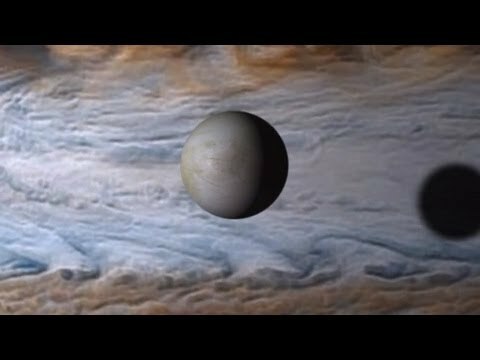 In the video below, a discussion on the Juno spacecraft and its crash onto Jupiter for the sake of planetary protection. Are There More Challenges for Interplanetary Contamination? In the far future interplanetary and even interstellar contamination might become a threat to spread infections or aggressive life forms into a new environment that is not prepared for them. All the recent plans to explore, colonize, and establish mining outposts on planetary bodies, especially on Mars, pose a severe contamination threat. If conducted carelessly, these operations can irreversibly damage the pristine environment of the planetary bodies. The search for extraterrestrial life might become impossible, and humankinds’ oldest question if there is or has been life on other worlds might remain unanswered. From another perspective, a further challenge for contamination prevention is the provision of adequate laws and policies. The Outer Space Treaty is becoming inadequate to the upcoming challenges in this field. Article IX is the only one that discusses contamination, and the treaty does not consider private spacefaring entities at all. As space is becoming more and more privatized, colonization and mining opportunities in space are following suit. Currently the Outer Space Treaty does not precisely cover these issues, leaving the preservation of celestial bodies from contamination from these new actors an unsolved problem. – By Lauren Napier and Sebastian Hettrich.